Dr Chris North and Dr Sebastian Khan (MPhys 2012, PhD 2016) work within the Laser Interferometer Gravitational Wave Observatory (LIGO) group, which won the 2017 Nobel Prize for Physics. In 1916, Einstein predicted the existence of gravitational waves as part of his theory of general relativity. He believed that large-scale cosmic events would cause ripples in space-time and send waves across the Universe. These waves would be so miniscule, though, that Einstein doubted they would ever be detected. For almost a century, their existence was the last remaining unproven prediction of general relativity. 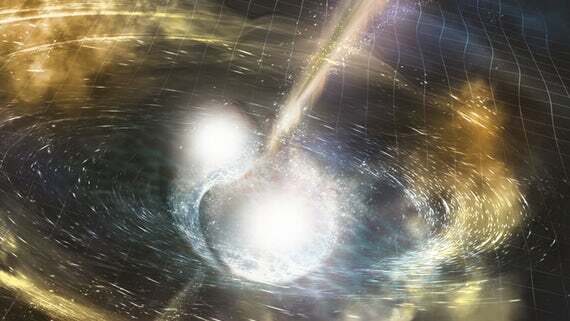 That was until 2015, when those of us working with the Laser Interferometer Gravitational Wave Observatory (LIGO) registered the subtle signature of gravitational waves from a pair of merging black holes. Laser interferometry involves splitting a laser beam and observing minute differences between the two halves. When the black holes collided they released more energy than the combined power of all the light from all the stars in the observable Universe, yet this caused the mirrors in the 4km-sized LIGO installations to move just 1/1000th the diameter of a proton. The door is now open to the unravelling of some of the biggest mysteries of our time. Cardiff University helped to unlock it. Of the many scientists listed as authors on the detection paper, 16 were from Cardiff, another 20 worked here at some point in the past decade, and nearly one-sixth of the citations in the paper, outlining the research on which the discovery was built, referred to Cardiff-based work. Cardiff students continue to work on the astrophysical interpretation of this event and many have gone into key roles in LIGO. The University is also building a new lab to develop future technology. We’ve changed our understanding of the Universe – and contributed to the winning of a Nobel Prize along the way. But the really exciting bit? The discoveries are just beginning.